Did you seriously drop the ball this year and forget to get all of your Christmas presents sorted in time for Sunday morning? If you want to avoid the crazy crowds at the shopping malls this year, there are a few options which you can order right now online and have your gift ready in time. And with services like Gift Whip, you can also give your friends and family the unwrapping experience – minus the mess – with the virtual unboxing webapp. Photo sharing sites like Flickr, DeviantArt and 500px make it easy to give the gift of a paid membership. In fact, just in time for the holidays 500px is offering a gifted upgrade at $39.95 instead of the usual $50. There’s really no limit to the kinds of sites that offer paid upgrades – just find out which sites your friends love and get them an instant upgrade online. Give your friends the gift of a Netflix membership or Hulu Plus. It’s simply a matter of knowing which sites they use on a daily basis. Memberships don’t have to be restricted to the Internet. Find out if your local museums, gyms, or other member-only spots allow you to give the gift of membership online. The Portland Art Museum, as an example, lets you do just that. Check out your local art and culture centres to see if they do the same. With gift cards there’s no limit to the kinds of gifts you can give, whether apps, books, music, gadgets, software and movie downloads. If you want to give your friends complete control over what they’re going to buy, and not limit them to just one store, you could always opt for a prepaid Visa giftcard, a Paypal Gift Card or an eBay Gift Card which you can purchase online. Amazon has some pretty cool options besides just sending a gift card via email. You can also choose to post the gift card on your friends’ Facebook walls, or e-gift a specific item. Of course e-gifting the item really comes down to suggesting something you think they might like, but they can use the gift card to buy something else. Another unique gift you can give is to donate to a charity on behalf of your friend, or better yet, let them select the charity of their choice. With Just Give you can email it to them, and can even use a photo of your own in the online gift card. Just Give has over 1,000 charities in its database, with causes ranging from human rights to the environment to disaster relief. Your friend can find the cause that is closest to home, and donate the money using your gift card. If you have a local charity in mind, you can get creative with your gift, and design it yourself, enclosing the cash for donation in the card. If you’re creative enough, you can probably come up with something cool, but for those of us who are more design challenged, there are a few free services you can use to print up a gift certificate of your own, like Regiftable. While you can give your friends an Amazon or iTunes giftcard which they can use on e-books, there might be a specific book you had in mind that you want your friend to read. 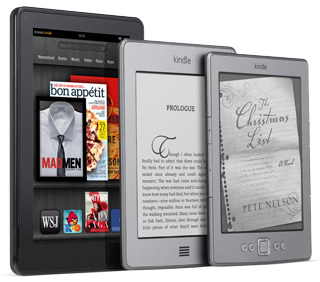 On Amazon, you can give your friends and family e-books through the Kindle bookstore. Just navigate to the book of your choice and click the ‘Give as a gift’ button. If your friend owns a Nook, you can do the same on Barnes & Nobles’ website. Apple’s iBookstore unfortunately doesn’t have this option at the moment. Most of our suggestions don’t require shipping, but if you’re an Amazon Prime member you can actually order an item right now and get it shipped in time for Christmas Eve. According to the Amazon timetable, paying $9.99 per item with your Amazon Prime membership will get the gift to you by the 24th of December. If you want your e-gift to be accompanied by a physical delivery you could always send a bouquet of flowers. With 1-800-Flowers, you can have a gorgeous bouquet delivered to their doorstep on Christmas Eve if you order it now. Do you have any ideas for last minute gifts that you can order right this minute and still get in time for Christmas? Let us know in the comments.